Sydney-based retained executive search firm Johnson is led by Jason Johnson, recognised as one of the most successful and influential search consultants in the world. A former Global Chairman of the Association of Executive Search Consultants (the AESC), Jason spent five years with Highland Partners (then one of the top 6 firms in the World), before founding his own business – Johnson. 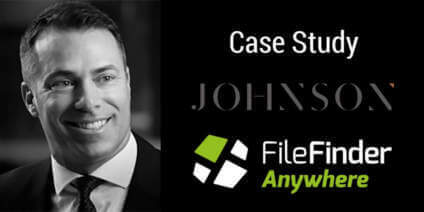 Johnson – which relied on a legacy version of FileFinder – grew to be one of Asia’s leading firms with 12 partners and 50 staff in offices across Sydney, Singapore, Hong Kong and Shanghai. Jason’s firm was acquired by CTPartners in early 2014, with Jason becoming Asia Pacific Managing Partner for the NYSE-listed corporation. He left in mid-2015 and subsequently launched a new business – again under the Johnson Brand. Jason’s new firm initially chose to implement the Invenias executive search software platform. Jason explained: “I was keen to run the new business in the Cloud. I knew FileFinder of old, and had always had a good experience with it. However, I perceived it as being a product that was ported to the Cloud, rather than one designed for the Cloud. I felt this would hold us back – Invenias was Cloud only, and so we went with that”. To achieve this, Dillistone provided a dedicated project manager and an engineer with extensive experience of converting data from Invenias to FileFinder. Jason agrees: “I’ve already recommended FileFinder Anywhere to other firms in the industry. It’s not just a database, it’s a true practice management system. Everything we do is dependent on it. We are delighted with our decision to switch to FileFinder Anywhere”.